Our surveys started about a week ago and we’ve had an exciting start to the season! Over the weekend we attached a transmitter to a turtle named Kailani. This transmitter will monitor Kailani throughout the nesting season to allow us to determine how many nests she lays and where she goes between each nest. We’re hopeful that it will continue tracking Kailani after she leaves our area at the end of the season. Kailani finishing up her nest. If you look closely you can see her tiny transmitter. We’ve seen four turtles so far which is pretty good for the first week of limited surveys. Our first turtle of the year was Kristin, a turtle tagged back in 2011 that we haven’t seen since. It’s always fun to catch a turtle that hasn’t been seen in nearly a decade. We also found Ember, a turtle that we tagged in 2014. We also had a long-time recapture – Windy! 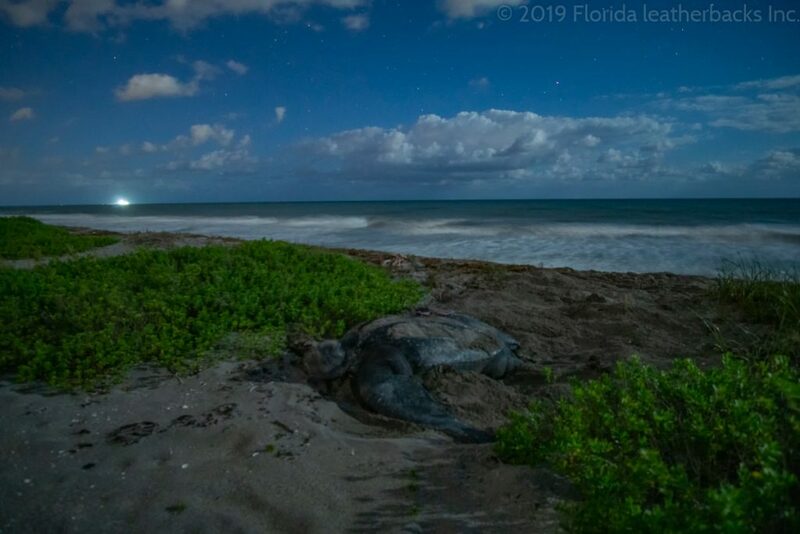 Windy was tagged back in 2003 and one of our biologists has a very fond memory of her – she was the first turtle she found while conducting her first solo survey as an intern! Windy also nested in 2006, 2007, and 2014. This entry was posted in Uncategorized and tagged blog, kailani, leatherback blog, research, tracking, trackturtles.com. Bookmark the permalink. ← The 2019 season is almost here!